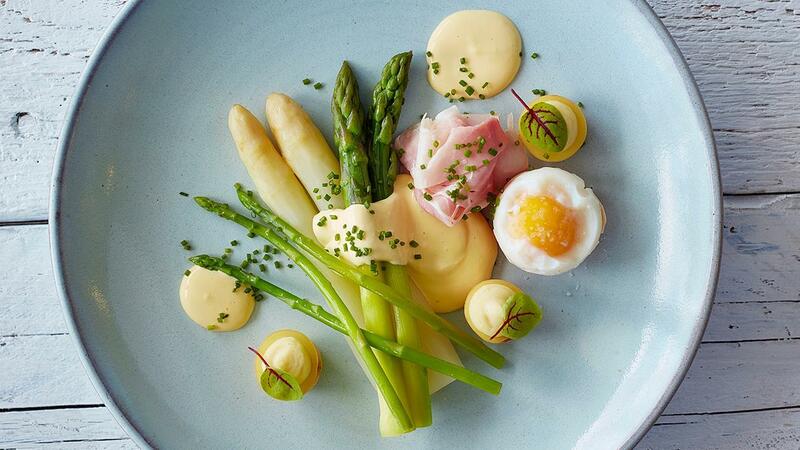 The healthy asparagus gets the royal treatment that’s low in effort and high in flavour. Serve these tender green and white stalks with complements of ham, potatoes, and eggs dressed in hollandaise sauce for a dish that’s truly wow. Keep them warm and sprinkle them with clarified butter. Boil the potatoes in their skin, cut in half and scoop out. Prepare the mashed potato and mix with crème fraiche. Fill the potatoes with the creamy mash. Boil the eggs for 3 minutes so they stay soft, then peel them. Heat up the ham in a low temperature oven. Place the asparagus on a warm plate. Place the ham, potatoes and the egg around the asparagus. Pour the sauce half over the asparagus. Garnish with sorrel leaves and finely chopped chives.